In life, who do you turn to when you’re faced with one of life’s many challenges? And who turns to you? The answer is your “social support network,” usually consisting of friends, family, co-workers, or a professional who can help. 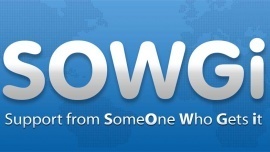 SOWGI is a social network that allows it’s members to instantly connect to give and receive support. Members can tap into the potentially unlimited support available from everyone in the “SOWGi Universe” or just request support from their own support network. SOWGi will create the "Ultimate Social Support Experience" by providing an environment where bonds between friends can be strengthened, new relationships can be formed and life’s many challenges can be resolved from the simple act of sharing our love and the knowledge we’ve gained from our experiences with one another. In doing so, we intend to inspire a “Social Support Movement” that will raise the consciousness of human beings all over the world and cause people everywhere to treat each other with more empathy and compassion than ever before. a. People who need support - Need an outlet to share things that a troubling them emotionally. They need a place to get help with an issue they are having. A community of like minded people that will understand where they are coming from. [#4] People have the need to feel loved and cared for by people in their lives. They may not always have the right person to talk to in their own daily lives and this gives them a place to find the love and support they need. b. People who want to give support - This is an opportunity to help your friends with an issue they or having in their lives or give support to a random person. A chance to give people answers/advice. Offer your support to someone’s cause, charity or company. [#4] People generally want to help other people because it makes them feel good. On some level this plays into their ego and the need to feel powerful. By being able to help others gives the person a feeling of worthiness or importance. [#4] SOWGi will allow these experts to be exposed to a highly targeted audience of people who can potentially use their services. d. Companies and Brands - Gives companies a platform to support the needs of their customers or employees. [#4] Every company and brand wants to form an emotional connection with their customers. SOWGi is a platform where emotional connections are happening organically, and this provides them an avenue to form those connections with potential or existing customers. e. Charities and Causes - Potential for them to create “Support Pages” where they can spread their message or even raise money through crowdfunding. [#4] Chance for them to spread their message through a receptive audience, grow awareness for their cause, raise money and again all through an emotionally driven platform. c. Experts/ Professionals - Free to create a personal profile but can charge for a professional profile. Can charge them to be promoted on SOWGi. Can charge them to advertise their services. [#4] They are able to target a very receptive audience based on what the user is requesting support with. For example, if a user posts a support request saying “The IRS is coming after me. Need some help with my taxes.” Imagine if I’m an accountant and now as a promoted SOWGi my professional account will show up in a side column as an expert who can help them. Additionally, I might search through support requests of people who are having tax problems, offer them so free help, add value to their lives and then also mention...by the way I’m a professional accountant (or whatever their profession may be). d. Companies and Brands - Can charge them to create company pages, advertise their products or services. [#4] Just like with professionals, companies will want to promote a product or service they offer that can help someone with a challenge they are having. Here’s an example scenario... You (SOWGi user) buy a brand new carpet and day 1 someone spills red wine on it. You go to SOWGi and post something saying, just spilled red wine on my brand new carpet I’m really upset about it and having trouble getting it out. Now imagine I’m OxyClean or the person who handles their social media. #1 Based on keywords in the post, we may serve an OxyClean ad to that person as a product that can help them with their support request. #2 If I’m an OxyClean representative and I see that post, maybe I send that person a short how to guide on how to get red wine stains out and a coupon for a free sample of OxyClean. You think the next time that person spills something they are going to buy Shout? Or are they going to remember how OxyClean helped get them through that situation (This is rhetorical of course). [#4] The user base on SOWGi will generally be there to help and support other people so naturally charities and causes will have an easier time getting their message across. If they are looking to raise money or even just build awareness for their mission, SOWGi would be the perfect place for them to create a “Support Page” and get the outpouring of love and even financial support that they may be seeking.